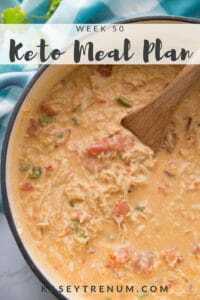 Are you looking for the Best Queso Recipe that also fits on your keto or low carb diet? Look no further! So many queso dip recipes out there include a lot of milk or thickeners that have carbs. This one is a perfect substitute that is delicious and super easy to make. My family loves Mexican food, especially queso dip. It’s so yummy and delicious and can be used many different ways, not just on tortilla chips. However, a lot of queso at restaurants is not keto friendly because of added milk and flour. Since a keto friendly queso dip is a great way to add extra fat I thought it would be a perfect addition to our dinner tonight. This was my first attempt at making a homemade queso dip and it turned out beautifully. Not only was it easy to make, but it was very flavorful as well. Tonight, I served it alongside baked chicken fajitas, but it would be equally delicious poured on top of taco meat, hamburgers, steak, or as a dip for deli meat or pork rinds. 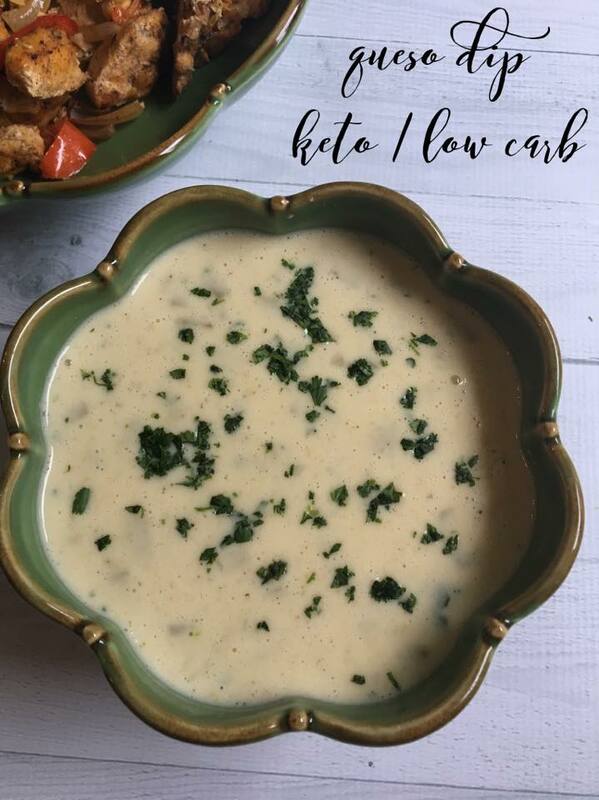 This is the best queso recipe for your needs as a low carb dieter or keto dieter for sure! Make sure to use a block of cheese and hand shred or grate this yourself. Not only do pre-shredded cheeses often contain fillers to keep them from sticking, but they also don’t melt as easily as a block of cheese will in this recipe. To make it simple to grate fast, toss your block of cheese in the freezer for a little bit before time to make the recipe. It will shred easily without crumbling too much. 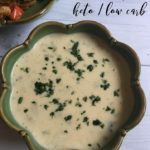 In a double boiler, combine butter, heavy whipping cream, spices (reserving 1 tablespoon of cilantro to sprinkle on top of the queso dip before serving), and water and bring to a slow boil then reduce heat to low. Slowly add cheese one handful at a time stirring with a whisk each time before adding more. Continue adding the cheese a little bit at a time while stirring continuously until all the cheese is added. I have found that using a whisk helps to incorporate the cheeses. Add the drained green chilis to the keto queso and stir to combine. Garnish the top with the remaining tablespoon of cilantro before serving. Serve immediately or pour queso dip into a small crock pot to keep warm. As always, I use the MyFitnessPal App to calculate the nutritional information on this recipe. 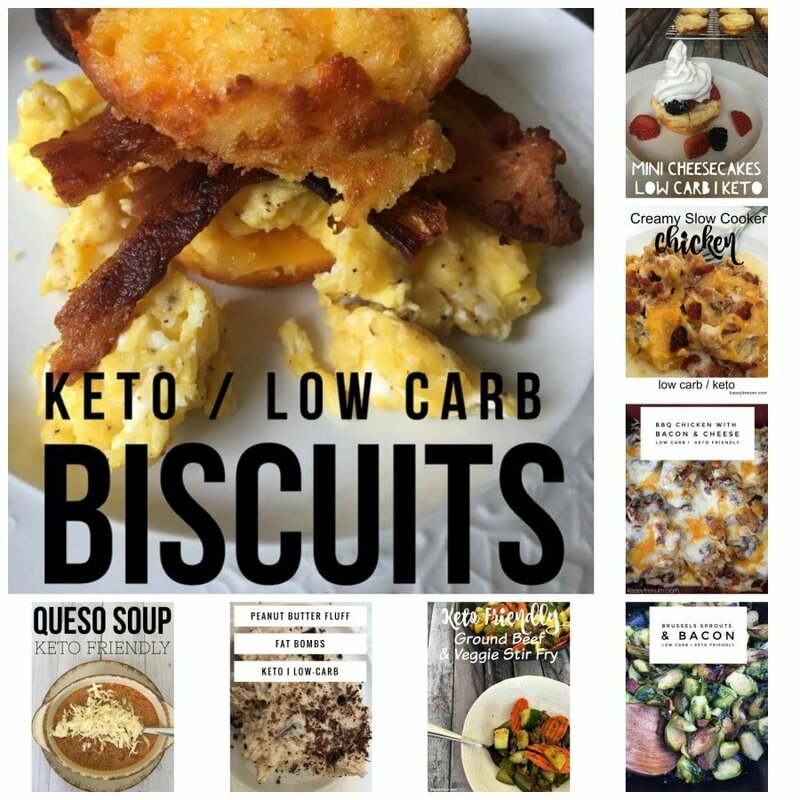 If you plan to make a recipe on your own and need a way to calculate things, check out my list of the best apps for keto macros. I love this recipe and believe it is the best queso recipe I’ve ever had. 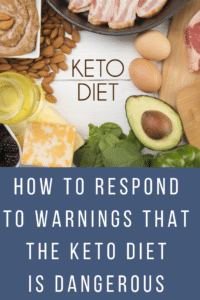 It is great for both keto dieters and non-keto diets. 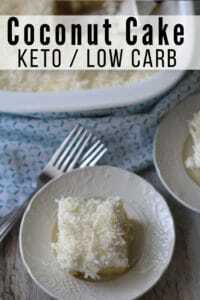 If you like this recipe, then you’ll love the ones we have on our Keto Recipe Index. There are tons of amazing recipes for dips, meals, soups, and desserts! 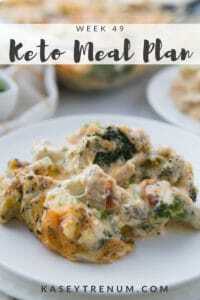 Below I will link some more of my favorite keto friendly appetizers to try! The nutritional information doesn’t show up. Can you post it, please? I just updated the info with the nutritional info. Thanks for the heads up. Mine turned out way to thick. I️t was a big glob of cheese. What did I️ do wrong? Hmmmmm…..I’m not sure. I’ve never had that happen. I found if you use pre shredded cheese it globs, shred your own and it didn’t. That would be true they add a chemical to keep the cheese from melting together. So it won’t melt in the bag. Saw dust is in pkg cheese. That’s why it doesn’t stick together. Anytime you are using a double boiler, it’s best to let your liquids get up to temperature, then slowly add the solids. That will go for cheese, chocolate, whatever you’re cooking. Don’t forget to be CONTINUALLY stirring or it will burn to the bottom. I hope this helps anyone new to double boilers! ? Does this refrigerate and reheat well? I want to take yo a work function, but need to make the night before. Can you make this without the double broiler? It’s the only way I have ever made it. You are welcome to experiment with other methods. I just made it in a glass bowl microwaving it in 30 second increments. It came out beautifully after four rounds/2 minutes. I put it right in a mini crockpot and it stayed nice for couple hours. Also let some cool and reheated it and it came out just fine. So yummy and all five people in my household approved. So glad you all enjoyed it. Thanks for the tips. This website would be great if it weren’t for the 5k ads crashing my browser. :\ I know we all gotta pay the bills but OMG this is so bad. Do appreciate the recipe though. The only way that bloggers can spend hours and hours creating recipes and then give them all away for free is through ads on our blogs. 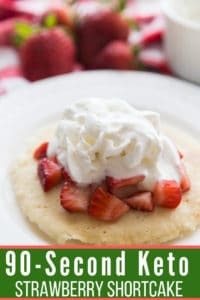 Without ads, it would be the equivalent to you going to work all day and then paying your boss for letting you work because there are many expenses involved in running a blog and in creating recipes. I have to justify the time I spend working, just like anyone else. We all work hard for our paychecks. The only way I can get paid and give away my recipes is through ads. The only other alternative is to not put any recipes on my site and charge for an ad-free cookbook. Today, while my family enjoyed watching football together and hanging out I spent over 6 hours working on a pancake recipe. It took me 5 separate batches to get that recipe right. I’m then going to spend another 2 hours editing pictures of the recipe and another 4 posting it to my site. In the end, it will be a 12 hour day creating one recipe that I will give away completely for free. I understand you may not enjoy the ads; however, without those ads, I wouldn’t be able to create recipes for anyone because it would cost my family too much money to do so. I for one appreciate the thousands and thousands of free recipes all over the internet at my disposal without ever having to pay a dime. This looks amazing! What do you eat it with/on since chips aren’t an option on keto? I love to pour it on top of Chicken Fajitas or you can use pork rinds as chips. Could also use cucumbers and celery! What do you think about adding a can of Rotel tomatoes? That is totally up to you. It sounds yummy. Omg this was DELICIOUS! I served mine over some taco seasoned chicken breasts. I made mine in the microwave in 30 second increments. Came out perfect. I am considering buying a double boiler for this and other recipes; what is the capacity of yours? We have a small kitchen so I’m wondering how small I can buy and get by with it. (And I’m bad at estimating on things like this! lol) I have been using your recipes for a while to help us get back on track doing low carb and you have been such a blessing to our family! I don’t have one, and I read above that a few people made it in the microwave at 30 second increments… I might give it a try this week.